Pandora continued its steady path towards subscriptions today with the announcement of a revamp of its premium radio offering Pandora One and confirmation of a forthcoming 9.99 tier. These of course have been in the works since its acquisition of Rdio’s assets back in November 2015. In the update Pandora One becomes Pandora Plus and gets new features including: ‘predictive offline playback’ for when signal drops, unlimited skips and unlimited replays. Pandora Plus may have a mid tier price point ($4.99) but it is not a mid priced subscription service, instead it is a premium priced radio service. This is not a revival of Rdio’s $3.99 Select offering nor is it a shot across Spotify and Apple’s bows. Nonetheless it is the start of a bolder streaming strategy for Pandora and it does raise the perennial issue of the case for mid priced subscriptions. Premium radio offerings like Pandora One Plus represent around 5 million subscribers in the US and are an important part of the market. But they are only the tip of the opportunity. The case for mid priced subscriptions is clear: $9.99 is not a mainstream price point. It is fantastic value for music super fans, but more than mainstream fans are willing to pay. 9.99 subscriptions will continue to grow solidly for the next few years as the remaining untapped super fans are converted. But once that base is saturated the market needs something more, that’s where mid priced subscriptions come into play, helping unlock the next layer of consumers. Mid priced subscriptions can represent the best of both worlds, delivering large scale and premium revenue. For mid tier to work, the music industry needs to have the confidence that the $9.99 product is good enough to keep its core customer base, that these users will not jump ship for a product squarely aimed at the mainstream. After a couple of years in the wilderness it looks like the marketplace is beginning to warm to mid tier once again. In addition to Pandora’s moves, Sony Music and Universal Music quietly launched the £5.99 Now Music app into the UK market earlier this year while MusicQubed’s MTV Trax has been getting large scale TV advertising support from Viacom. Meanwhile QQ Music and Apple Music are both driving scale in China with a price point equivalent to around $2. $9.99 was always a blunt instrument, a sledgehammer to crack a nut. Now though, while $9.99 adoption is still growing, is the time to have a far more sophisticated approach to pricing. The safe option would be to wait until $9.99 growth slows. But by then it would be too late. The renowned LSE this week published a paper arguing against implementation of the UK’s Digital Economy Act and calling for policy makers to recognize that piracy is not hurting the music industry but is in fact helping parts of it grow. To these academic researchers the findings probably feel like some dazzling new insight but to anyone with more than a passing understanding of the music industry they are as if somebody just time travelled back to 1999. The piracy-helps-grow-the-pie / help-makes-the-sky-not-fall / actually-helps-the-industry arguments were common currency throughout most of the first decade of the digital music market. In more recent years though, following perpetual revenue decline and the growing plight of struggling ‘middle-class’ artists and songwriters, most neutral observers recognize that the piracy=prosperity argument just doesn’t hold water anymore. Though of course that won’t stop the pro-piracy lobby fawning over this ‘research’ as more ‘evidence’ for their case. Live revenues are over reported: as impressive as global live revenues may look, they are not accurate. Most often they include reseller revenue, which is income that does not go anywhere near the artists or any other part of the actual music industry. A scalper reselling tickets at extortionately high prices on eBay doesn’t benefit an artist in any way but at a macro level can look like booming revenue. Price hikes drive revenue: Much of the live revenue growth is actually from increased ticket prices, both from venues and resellers. The average ticket price has increased by 34% in the last 10 years. Only a portion of this increase gets passed back to artists and their managers. Live income is unevenly distributed: Live simply isn’t working for many artists, those that do best are those are heritage acts. According to Deloitte 60% of the 20 top-grossing US live acts are aged 60 or over. This is where promoters and venues focus their efforts and it leaves little oxygen for the emerging acts. The live boom will suffer: The likes of Bon Jovi and the Rolling Stones sell out massive arenas because they sold so many albums in the glory days of the recorded music industry. What will happen when the generation of artists that do not sell millions get to the age where they hope live will pay the bills? The likelihood is that there will not be another era of heritage live acts such as we are seeing today. A dependence on live income for building the case for piracy is thus fraught with difficulty and misunderstood assumptions. The Right to Not Earn a Living? Any discussion of the music industry makes an assumption about what actually constitutes ‘the music industry’. There is no single right or wrong answer other than the bits that really matter are the artists and the songwriters. Therefore any proposal or framework for ‘saving the industry’ needs to ensure they can thrive. Diminishing music sales and the various above-stated issues surrounding live mean that for most ‘middle class’ artists who didn’t make it big in the glory days of the CD are finding it harder to thrive. Another tired argument that the LSE paper rehashes is the idea that artists should just want to make music for music’s sake. That because of platforms like Soundcloud they can just make music without expecting or wanting to earn a living. Of course every single one of us could do the same for our job too. A call centre operative could offer to forgo their salary, a bus driver could drive for free, a doctor could refuse her pay. All of which sound ridiculous of course, so why doesn’t it when applied to an artist? Well actually it does, and that’s the point. The idea that somehow because music is creative that artists should not pollute this with seeking to earn a living is an utterly insidious concept. If the LSE scholars truly believe this then I recommend that they henceforth refuse their stipends and insist on lecturing for free for the rest of their careers. And if they start finding the bills stacking up maybe they can start selling t-shirts or something? When I spoke to Marillion’s Mark Kelly for my forthcoming book he made devastatingly simple comment on the impact of free and alternative business models on artists: “Artists have choice, a choice of what? To not earn a living?” Piracy is having a hugely tangible and real impact on artists and songwriters, and guess what, it is not a positive one for most. Does the music industry still need to undergo dramatic change? Of course it does. Do many record label practices still need changing? Of course they do? Do Artists need to get even better at making alternative revenue streams work? Of course they do. Should change be happening more quickly? Yes, of course it should. But crucial progress is being made on all fronts and what matters most is that all responsible parties and stakeholders (and that includes government) do what they can to ensure that a fair and level playing field is created. Not for the sake of an ethereal macro economic concept of ‘the music industry’ but for the the struggling indie label boss, the small gigging artist, the part time manager and the aspiring songwriter. Ask them what they think about piracy and how it is impacting the music world. That’s where you will heae the answer most grounded in earthy reality, not in an academic reworking of obsolete, half baked piracy lobby arguments from yesteryear. 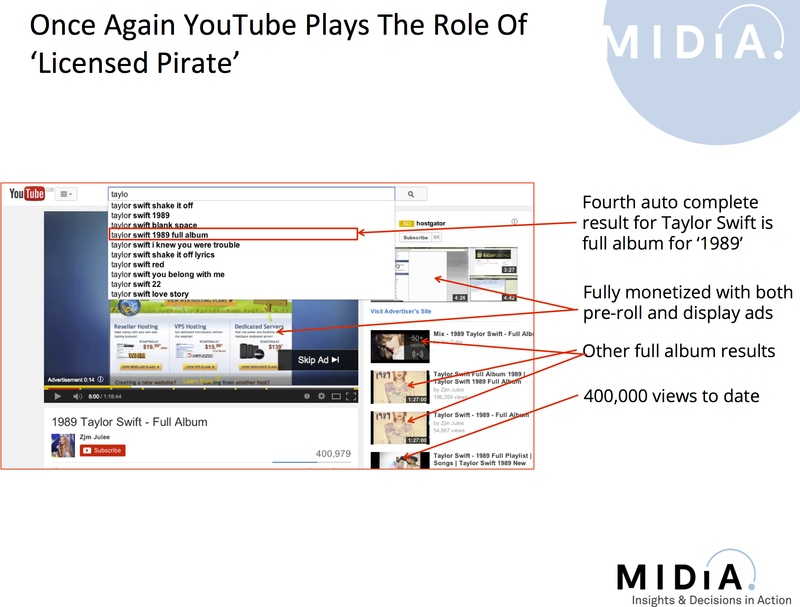 Back in 2009 I wrote a report for Forrester Research entitled ‘Music Release Windows: The Product Innovation That The Music Industry Can’t Do Without’ (you can read the summary blog post here, and the ‘money’ graphic is here). In the report I proposed that the music industry should adopt three release windows based around a ‘Preview’ window for premium customers, a ‘Mainstream Pay’ window for CDs and downloads and a ‘Free to Air’ window for ad supported streaming. With all of the brouhaha surrounding the Atoms for Peace withdrawal from Spotify, release windows, and the role of streaming services more widely, are very much back centre stage. But whereas I strongly believe in the case for release windows, I believe that, as per my 2009 report, that paid subscriptions should be in the first window, not the last. It is free-to-consumer, ad supported streaming that needs to be pushed to the back of the queue and it is high time that the windowing and streaming debate in general makes a clear distinction between the two very different propositions. Music fans that pay 9.99 for a Rhapsody, Spotify, Deezer or Rdio subscription are among the globe’s most valuable music consumers. These music fans need treating as such, almost regardless of the business models that may surround their consumption points of choice. It is not their fault that the music industry and tech sector contrived to construct business models that have propagated doubt and division among many of the industry’s key stakeholders. This is not to dismiss the absolutely crucial issues of sustainability and equitability, but instead to raise the issue of who is paying most the price of windowing? The services or the fans? There isn’t a clear-cut answer, and the decision dynamics are analogous to those of applying economic sanctions on a nation state. Think of subscription services as ecosystems not silos: There used to be a physical journey between the radio and the music store. Now in subscription services discovery and consumption are symbiotically joined. This means that the radio promotion approach can be played out in subscription services and in doing so reach the most valuable customers based on their music preferences. Thus when the radio window hits weeks later it will be targeting a largely distinct group of consumers for whom it will still be the first time they have heard the music. And for those that are subscribers and radio listeners, the few weeks delay may prod them into reengaging with the album they first heard on their subscription service. Window albums not singles: Singles are invaluable tools for promoting albums and tours. There is less need to apply windows to singles, or rather to the lead singles from the album. To protect the value of the premium release window though, it is important that only one single hits the free to air channels before the album hits the first window. Else the impression is given of too much content being too widely available elsewhere. Combat scarcity with new products: Of course the biggest challenge to windowing is the lack of scarcity i.e. what’s the point in turning off the tap if its available elsewhere? There are two answers to this 1) by ensuring content is available first only on the premium platforms, the availability of content on free platforms is markedly reduced (radio and YouTube account for the VAST MAJORITY of music listening, P2P is in decline) 2) more has to be added to the premium music products to make the windowed content act as a complement to a rich, curated product experience not available elsewhere. Two examples of how to do this are artist subscriptions and D.I.S.C. products. It is still too early in the emergence of widespread streaming adoption to draw definitive conclusions about the impact of windowing but there is a growing body of useful evidence. Spotify’s Will Page this week released a report that brings some invaluable evidence and analysis (you can read the report here). Although Will is obviously on Spotify’s pay roll and Spotify clearly have an agenda to push, Will is a diligently objective economist with an impressive track record at the UK’s PRS for Music, and his work should not be dismissed on the grounds of assumed bias. In the report Will pulls data from Spotify for streams, GfK for sales and Musicmetric to compare the performance of albums across all three channels for windowed and non-windowed albums. The broad conclusions on the sample of albums tracked is that non-windowed albums did not appear to lose sales but that windowed albums had much higher piracy rates. Significant caution is required when interpreting this type of analysis, principally because it is impossible to definitively identify causal relationships e.g. the marketing strategy of one artist might tend towards piracy activity than another, as might the geographical location of the artist and the global distribution strategy. But even with these caveats, the report presents some solid directional data. The market needs much more data like this and I will be adding to the data pool later this summer with a white paper that I’ve been working on for some months now. Windowing does not address most of the broader issues that currently surround streaming. It can however be an important part of the equation if, and only if, it is done on the basis of distinguishing between free-to-air streaming and paid streaming. Though not quite as distinct as an iTunes download is from a Torrent download, the parallel is nonetheless provides useful context. This is not to discredit the huge value of radio, YouTube and Vevo in driving music discovery, nor the equally strong value of freemium service free tiers in acquiring customers. This is not a proposal to remove content from free-to-air channels, but instead one to simply not put everything there straight away. As the music discovery journey and consumption destination become ever more entwined, it is time to think long and hard about just how much leg needs to be shown to make a fan fall in love with an artist’s music. On Friday Google announced that it would start to downgrade the search results of sites which have “high numbers” of copyright takedown notices. Make no mistake, this is a major step forward and is something record labels have been pushing for. Over the last year labels and their trade bodies including the RIAA, IFPI and BPI, have shifted some of the emphasis of their anti-piracy efforts from pursuing the symptoms of piracy (e.g. suing file sharers themselves) to tackling piracy at source (e.g. blocking domains and search results). Though there are ‘freedom-of-Internet-speech’ issues surrounding this approach, it makes sound strategic sense, with a much higher potential degree of effectiveness, and without the PR own-goal of taking your own consumers to court. Google’s takedown process is imperfect. Google has made major strides in working with copyright owners during the last year, with many labels reporting marked improvements in the takedown process. But the process still has flaws, such as arbitrary limits on the number of claims. Also the process is resources intensive, both for Google and rights owners. So takedown efforts and the resulting list of key infringers is going to lean towards the short head rather than the long tail. Which means the most popular destinations will be hit most while the new up-and-comers will have an opportunity to become established before they feel the effects of downgrading. Downgrading will impact individual site audiences relatively slowly. Search result downgrading will also be slow to impact the popular piracy sites whose established user bases will typically go direct to sites via bookmarks or use alternative discovery methods such as torrent trackers. Downgrading will impact their new user acquisition but existing audiences will dwindle more slowly. Why downgrade when you can block? If Google genuinely believes that the target sites warrant downgrading because of copyright infringement, then why only go as far as downgrading? Why not just all out block? Just how effective will downgrading be? Will the results drop down the page? Disappear off the front page? Or disappear beyond page 20? (I do not think, though, that there is a case for Google to proactively increase the performance of licensed services as some are pushing for. Firstly these services should invest more heavily in SEO and SEM like everyone else has to. Secondly prioritizing results would fly in the face of Google’s entire search business proposition. And if music sites get a boost then why shouldn’t everyone else? There is strong precedent for Google downgrading – such as the recent link-farm downgrade – but not boosting). Some serial infringers are more equal than others. Veteran search guru Danny Sullivan, in typical fashion, managed to uncover a really interesting angle to the story: that Google-owned YouTube will not find itself on the downgrade ‘hitlist’ despite having more takedowns than probably any other site. Though this certainly smacks of double standards –and raises issues about separation of church and state – there is a pretty compelling case for ensuring YouTube remains readily accessible: namely that it is the #1 digital music app in the world. (Granted it may cannibalize many more valuable services, but that’s a separate issue that the industry and Google need to fix). Of course, the entire takedown and downgrading strategy cannot be viewed in isolation. Google are a reluctant copyright enforcement force, as they make clear by ensuring that every DMCA-complaint blocked search result links through to http://www.chillingeffects.org/ (an Electronic Frontier Federation backed site that helps sites who have had DMCA takedown notices strike back at content owners.) Google are going down this path of ceding more ground to content owners not because of a strategic change of heart, but because they want something back. Whereas Apple has made paid content a success in the iTunes ecosystem, Google has thus far failed to achieve much in the Android ecosystem. (Or to put it more accurately, in the various Android ecosystems – which is of course one of the core problems for Google). Google Play is Google’s big content play (no pun intended) and they want more in it from content owners, and they want to take it to more territories. Taking the action that they have done so is designed to make those prickly licensing conversations with rights owners that bit smoother. And Google may well get a lot of what they want. They’ve pretty much played hard ball so far, taking the position that they can bring more scale to the music industry than any other partner and so should be given preferential terms. And they back this position up with a pretty good poker face too, as illustrated by their refusal to meet label license fee demands for a point-and-play locker service and instead following Amazon’s lead in launching a DMCA compliant upload-and-play locker service. Now they can come back to the table with the ‘we’ve done what you asked us to do’ card in their hand. Music industry, over to you, raise or fold? But the point of this post isn’t just to pour another layer of opinion into the simmering cauldron. Instead I want to try to move the debate on from diagnosing the symptoms onto identifying a potential cure, or at the very least some palliative care. The key reason fewer people buy music is because they don’t have to. In the analogue age there was a monopoly on supply of music: if you wanted to get new music you had to buy it in high street shops when record labels decided you could, paying the price they and retailers decided you should. The alternative was making a poor quality cassette copy from the radio or friends. People who liked music had little choice but to associate a very specific monetary value to music. Napster threw that scarcity model out the window. With paying for music now a life style choice the monetary value of music has been subjected to hyper deflation. The ‘price it and they will come’ logic now only applies to a small subset of music fans, a subset that is at risk of becoming an endangered species. “I love music and if I could download my Nike I would pay for my music”. Nike still has scarcity, that’s why so many kids pay for their trainers but not their music. Like it or loathe it, as far as music products are concerned, we are in the post-scarcity age. What, if Anything, Can Be Monetized in the Post-Scarcity Age? So if scarcity has gone – and it is gone for good – how can recorded music revenues ever be rebuilt? Indeed should they? Some argue that charging for music is an outdated model, but you will find that 99.999% of those people also believe that they should still be able to get that exact same music which they don’t think should be paid for i.e. they value the product, just not the price. Their world view is shaped by the last decade of experience but lacks grounding in basic economics. The music needs making and that costs money. Whether that is the money the label invests when it takes a punt on an artist or the cost of an artist getting by on an often very modest income. Arguing that artists should make their real money in ‘ancillary services’ misses the bigger picture. Only a tiny subset of music fans pay for merchandize and only about half of music buyers go to concerts. And the number 1 music consumption channel? It’s still radio. So those ancillary revenues are a much smaller addressable market. They are also largely irrelevant if you are a songwriter rather than a performer. Recorded music is still the core product. 95% of us listen to music most days. The vast majority of music consumption (by all people) is recorded music. Why shouldn’t it also be the core revenue stream? Scarcity has been disrupted, not market demand. None of us would reasonably expect a plumber to fix our washing machine for free and then go out into the street and make his money by selling overalls and tools. Also let’s not forget that most artists make music because they love making music, not T-Shirts. Don’t get me wrong: of course artists have to learn how to make money across a much wider range of income streams than ever before, but there is no inherent reason that they should have to accept that their core creative asset is no longer monetize-able. The channel, product and pricing strategies may be broken, but the creative heartbeat of music is not. Simply applying a ‘flat rate’ fee on all the music in the world might seem like an elegant and ‘convenient’ solution. But it will only exacerbate the problem. It will formalize and legitimize the concept that music has little value. It will also accelerate the demise of those music fans who still like to support their favourite artists by buying their music. ‘Flat Rate’ is a pricing strategy for the low end of the music market, not all of it. Even if music has to end up like water, there should still be a market for bottled mineral water. Of course unlimited access to music in the cloud will play a really important part of the future of music, it will probably be how most people consume music. But that is a service which should have clear monetary value. Everyone accepts that premium Cable and Satellite TV packages are paid for commodities. 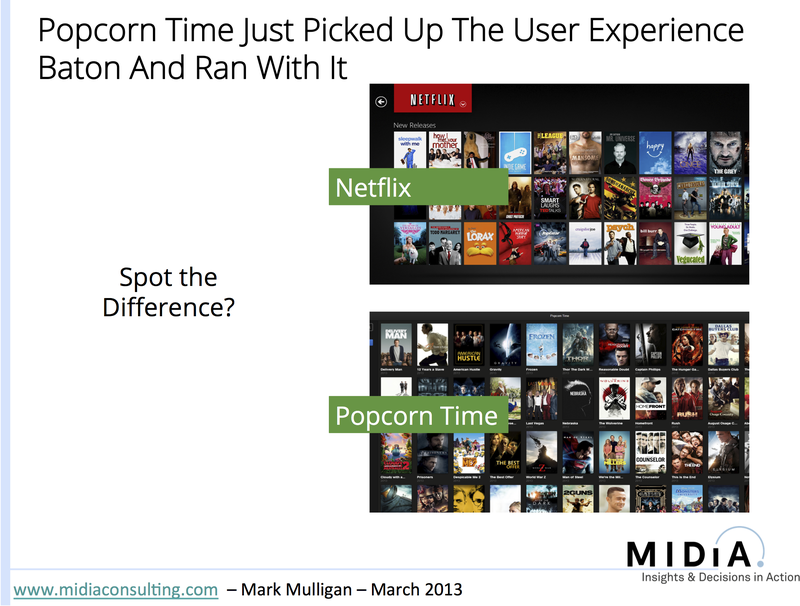 In fact consumers pay more to have some of that content provided on-demand. The reason it is different for music (and indeed news) is of course scarcity. 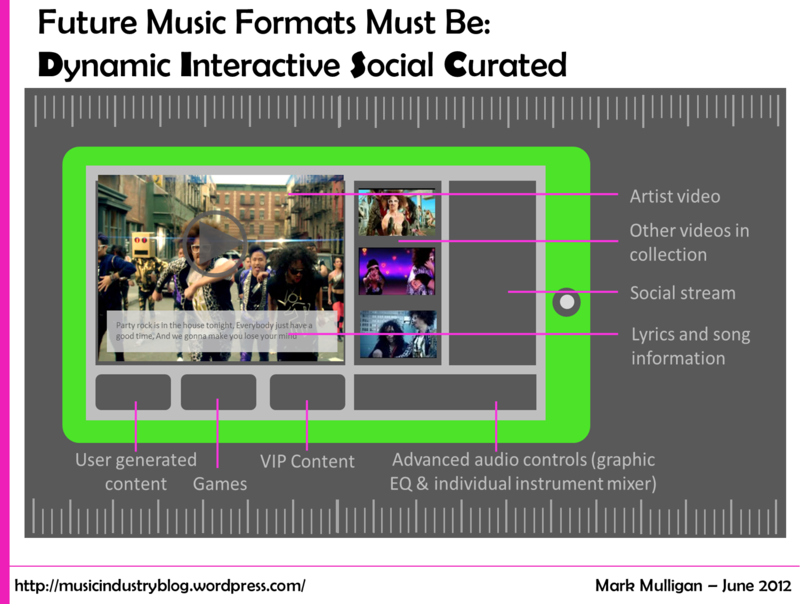 The future of music products will be app like experiences that deliver unique, interactive and curated music experiences where the whole will be far greater than the sum of the parts (see figure). Pirating the individual components will lack the context rich, curated and programmed environments in which the music experiences will occur, and will consequently have massively diminished value. Scarcity will have returned to music products. Monetizing convenience only accelerates a race to the bottom. Convenience should be an inherent part of the value of music products, but only one part. Just because current music products don’t deliver enough tangible extra value to persuade the likes of Emily White to pay for music does not mean that it must always be thus. Until 26 months ago the market between smartphones and laptops was that of netbooks. At that stage most consumers not only did not own a netbook, they would have reported that they never intended to buy one either. Then along came the iPad and suddenly we have a product revolution on our hands. An apparently dead market segment transformed virtually overnight into gold-rush prosperity. The music industry needs an iPad moment. When it does come (and it will) even the likes of Emily White may finally start to see the value in paying for music again. What Happened to the RIAA’s Missing 3.5 Million? The RIAA has highlighted research which indicates that its closure of P2P site Limewire has significantly reduced P2P levels in the US. Unfortunately the evidence is not as clear cut as it may first appear. P2P is a technology in decline for music piracy. Consumers are going elsewhere, to what I term Non-Network piracy. That is, activities such as Bluetoothing, harddrive swapping, phone ripping, darknets, binary groups, lockers etc. Individually each activity is small but collectively this is where music piracy is heading. I remember in my days as a JupiterResearch analyst that as we watched German P2P penetration decline steadily year-on-year in apparent response to music industry anti-piracy measures, we also saw Germany become Europe’s largest Non-Network Piracy market, actually exceeding P2P penetration. And that is going back a lot of years now. Today much more still needs to be done to better understand Non-Network Piracy, particularly so in the age of cloud-based music experiences. Because the same arguments about ownership mattering less for legitimate services apply to piracy. Downloading an MP3 file from BitTorrent may seem as incongruous to a Digital Native as buying a CD. Measuring piracy effectively in the age of cloud means viewing illegal streaming services and even music blog streams in the same way as illegal downloads. Bottom Line: many of those missing 3.5 million will actually be happily sating their appetite for free unlicensed music via Non-Network Piracy. People lie. I’ve been tracking music piracy for long enough to know that it is unwise to draw definitive conclusions about year-on-year trends. In Sweden for example, in the early and mid-noughties P2P penetration dropped from 28% to 18% following the closure of a legal loophole and then again to 12% following government enforcement. Within a couple of years penetration was back up in the mid 20’s%. Furthermore the main ISP Telia reported that it had seen no noticeable decline in P2P traffic levels. As Dr. House’s mantra goes ‘People Lie’. On the one hand this proves that enforcement is effective in that it makes people conscious they are doing something wrong and don’t want to admit to it, until the heat dies off. But on the other it suggests that the impact can be superficial for many file sharers. Though untruthful respondents should be less important for Nielsen’s panel methodology than NPD’s survey methodology, bear in mind that file sharers are often pretty savvy consumers who use dedicated computers for download. So it is not unreasonable to expect many to switch their P2P activity from their metered PC for the same reason they wouldn’t admit to file sharing to a survey vendor. Bottom Line: surveys are better at measuring consumer attitudes to piracy than they are actual behaviour. Limewire is closed! A 95% reduction in usage of Limewire by Limewire users sounds pretty impressive until you consider that the site was actually been closed down by the RIAA in October 2010. Limewire agreed to ‘stop supporting and distributing’ its P2P client. A number of unauthorized spin-off clients (such as LimeWire Pirate Edition) were created but a visit to Limewire’s site reveals a message urging users to refrain from using these apps and to remove them from their computers). Bottom Line:the majority of Limewire users unsurprisingly stopped using the defunct client. P2P users are holding their breath. A significant share of the missing 3.5 million may well have stopped downloading illegally for now. But if they are not buying downloads nor using Non-Network Piracy then they have markedly changed their music consumption behaviour, perhaps increasing their use of YouTube, listening to more radio, watching more music TV. For active music downloaders this means an effective dis-engagement from music, falling on the ‘supporting’ channels as their main behaviour. This will have 1 of 3 long term outcomes: 1) they remain disengaged, casual music fans 2) they finally opt for legal services 3) they eventually go back to piracy. Of the three, the third is the most likely outcome. Bottom Line: nature abhors a vacuum. The last factor is arguably the most important, particularly in the context of locker services running scared in the wake of the Megaupload arrests. The demand for free music remains whatever happens to supply. Closing most of the current illegal channels creates a demand vacuum that will unfortunately be filled, and the history of music piracy to date teaches us that what comes next will be even more difficult to enforce than its predecessor. However there is a fortuitously timed wildcard factor which may help aid the digital transition. Since July 2011 Spotify has been available in the US, so many of those lost Limewire users may quench some or all of their free music thirst there. But because we still don’t have any definitive data to suggest that Spotify is reducing piracy so we must keep Spotify as a wildcard for now. The single most important anti-piracy strategy remains innovation, experimentation and working with our technology partners to offer fans an array of legal music experiences. I couldn’t have put it better myself. Of course enforcement remains an important part of the mix, but there is an increasing risk of negative ROI (both in financial and publicity terms) that the music industry can ill afford at the moment. Closing down sites hits supply not demand. The solution to piracy lies first and foremost in innovating to meet those clearly demonstrated consumer needs.